Myoko is no big city. 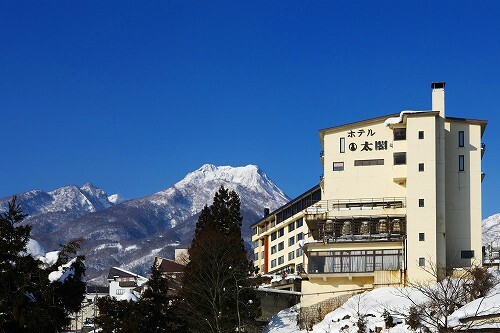 It's a real mountian ski town, snuggled in at the base of one of Japan's most beautiful mountains. Here you will find the profound silence that comes with the heavy snows. The billowing steam of onsen (hot springs), ready to warm you after a day in the snow. Delicious local soba noodles and sasazushi (a unique style of sushi using local bamboo leaves), as well as other Japanese, Western and Chinese cuisine. Fine saké painstakingly made by local artisan brewers the old-fashioned way. The friendly faces of passers-by, greeting you with a hearty ohayo gozaimasu! Sublime sunrises illuminating Mt. Myoko; the beauty of Lake Nojiri, so close it seems that you could reach out and touch it when you're on the ski slopes; even the Sea of Japan, seen off in the distance from the higher ski runs.